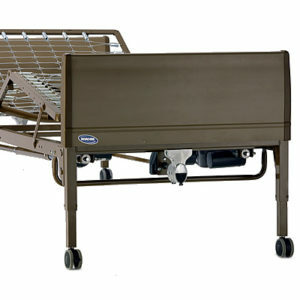 The Invacare Full-Electric Bed offers the greatest convenience for the patient and caregiver. The easy-to-use pendant control provides motorized positioning of the upper body and knees, and also adjusts bed frame height for efficient use of accessories and for safe and easy transfer. High impact bed end panels are more durable, impact and scratch resistant; washable for easy cleaning. Quiet motor operation and fast cycle time on lowering height of bed allows for efficient bed set-up. Ergonomic hand pendant comes with durable strain relief and heavy-duty cord.